What Are The Best Bioderma Products? Ever wondered what the best Bioderma products are? I know you do. Quite a few of you have requested this post. 😉 Cos no matter how cool Korean beauty is right now, the allure of French skincare just won’t die. The French know how to make basic, gentle skincare anyone can use. But not all products are created equal. Some are better than others. And when you’re parting with your hard-earned cash, you want to invest in the best. Bioderma Sensibio H20 is iconic for a reason: it works. Ok, it struggles a little with waterproof mascara but it gets rid of everything else – think dirt, grime and makeup – quickly. Plus, it’s super gentle. Even sensitive skin can use it without fear of dryness and irritation. The best part? No need to rinse. It’s a lifesaver when you’re on-the-go. Warning: Sensibio AR contains mineral oil. I don’t think that’s a bad thing. For starters, mineral oil is very moisturising. It creates a barrier on the skin that slows down water loss, keeping it hydrated for longer. Plus, it’s super gentle and NOT toxic (I don’t care what you’ve read on natural beauty blogs, there’s not one shred of scientific evidence that shows mineral oil gives you cancer or worse). But what gained the cream is place in the top 5 isn’t mineral. It’s the addition of antioxidants and anti-inflammatory fatty acids that help fight premature wrinkles, soothe irritation and keep rosacea under control. Now, that’s impressive, isn’t it? The name says it all. Bioderma Hydrabio Serum is a very hydrating serum that contains every humectant under the sun. FYI, humectant is a fancy way of saying that an ingredient can attract moisture from the air into the skin. Hyaluronic acid is the best: it can hold up to 1000 times its weight in water! Here, it has glycerin, xylitol & co to give it a helping hand in drenching your skin with moisture. Plus, niacinamide’s joined the party too. This form of vitamin B3 moisturises skin, soothes irritations, treats acne, reduces wrinkles… It’s a skincare do-it-all! I know a lot of you don’t like silicones, but they have their uses. In Bioderma Sensibio Pore Refiner, they blur out the skin, making your large pores look smaller. Plus, they give your skin a matte finish that keeps oil at bay for a few precious hours. Yep, these benefits are only temporary. That’s the downside of silicones. If you’re looking for a more long term solution, turn to salicylic acid. This exfoliant gets inside the pores, removing all the gunk that makes them swell up so much. FYI, Pore Refiner has salicylic acid but the high pH means it can’t perform at its best. Bioderma Photoderm AKN Mat Mattifying Fluid SPF 30 isn’t that mattifying. But it still makes the list because it provides excellent broad spectrum protection. It uses a mix of avobenzone and tinosorb, two lightweight UV filters that don’t leave a greasy residue or a white cast behind. Plus, it has a sprinkle of antioxidants to boost the UV filters and maximise your protection. The only con is the fragrance. If you have sensitive skin, this isn’t the best sunscreen for you. Related: What Are The Best UV Filters? 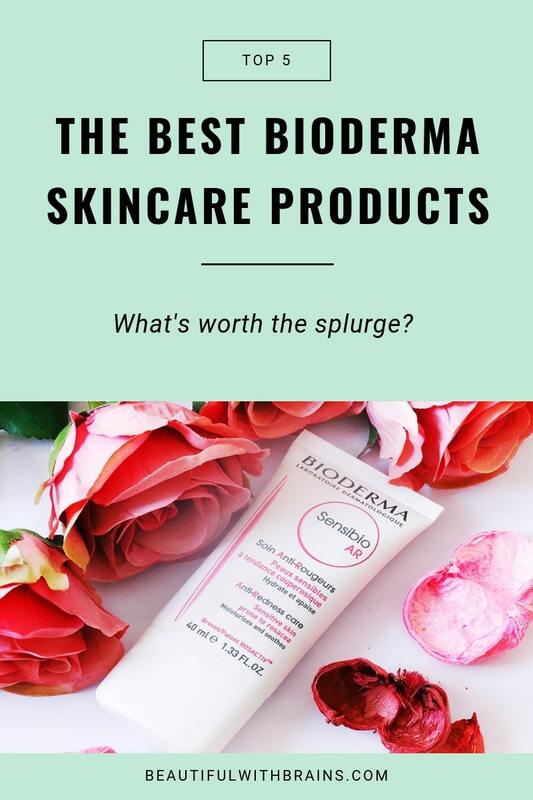 What do you think are the best Bioderma products? Share your fave picks in the comments below. Andrew, that’s a good one, too. I don’t think Bioderma Photoderm MAX 50 Fluide is available in Canada. Thelma, oh no, what a shame. On Amazon, you can get 1 litre of Bioderma shower gel or oil for less than $20 (without shipping fees), which is cheaper than Cetaphil by volume. K, that’s a great deal. Thanks for sharing.